– Mary Ann Jones; Manager, Health Care Planning; Pitney Bowes, Inc. The incidence of cancer is going up. According to the most recent statistics, about 1 in 2 men and 1 in 3 women will be diagnosed with a life-threatening form of cancer in their lifetime. But more and more people are surviving cancer, and many of them prefer to stay on the job while they’re managing their treatment or caring for a loved one who is in treatment. So how do you keep these experienced employees present and productive and keep your company running efficiently? The answer: Work Stride. Work Stride also includes a special section about HR laws and policies as well as a section for managers, to help them balance the emotional and logistical needs of their employee with the business demands of their workplace. Johns Hopkins – among the nation’s most highly regarded cancer centers for diagnosis and treatment – was not particularly good at supporting its own employees with cancer or those who were providing care for a loved one with cancer. 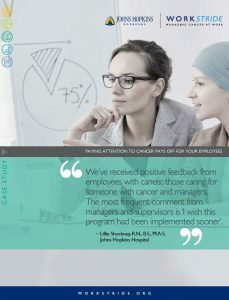 The challenges and results of Johns Hopkins effort to focus on its employees impacted by cancer are outlined in this case study.